el precio no varia por la reducción del grupo. Vacahouse 2 Backpacker’s is a modern hostel located in the center of the city of Huaraz, the property has 16 rooms, with a big garden, a roof terrace with a view of the mountains, a wifi connexion in all the hotel, a TV room and a shared dining room. The establishment was designed for the modern traveller. We have a wide range of rooms, private or shared, in case you come alone, in couple or with your family or friends. If you like discovering new people of the entire world and if you are a sociable traveller, you can choose our rooms of 6 or 8 beds, with bunk beds and big lockers for your luggage. If you are a group of maximum 4 friends or a family and if you want a bit of privacy, we have rooms with 4 beds, 3 beds, 2 beds and matrimonial rooms that will allow you to relax and enjoy our city in an unforgettable way. We are located next to the river, more exactly on the left shore of Quilcay River. We are about ten minutes walking to Boulevard Pastorita Huaracina. Furthemore, the city center is quite accessible from our position because you can walk up to there. You will have a nice walk of 15-20 minutes up to the city center, where you will discover all the main attractions of this wonderful city such as the Cathedral, Pumacayan or 'La Casa de Guias'. Our rooms have private bathroom, hot water, bedside table, wifi, windows with a view on the mountains and on the garden. 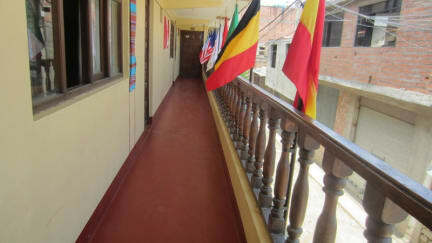 In addition, as you can imagine, as a Hostel we also foster our social sphere and attitude. Hence, this means we have at the travellers and guest disposal several common areas where they can meet ans talk each other. Vacahouse 2 Backpackers Policies and Conditions.